The V-2 (German: Vergeltungswaffe 2, "Retribution Wappen 2"), technical name Aggregat 4 (A4), wis the warld's first lang-range guided ballistic missile. 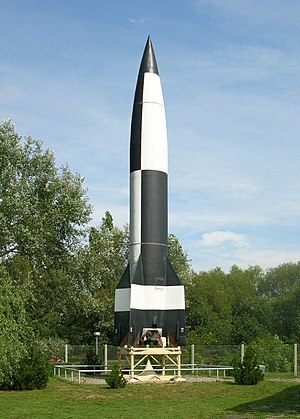 The missile wi a liquid-propellant racket ingine wis developed during the Seicont Warld War in Germany as a "vengeance wappen", assigned tae attack Allied ceeties as retaliation for the Allied bombins against German ceeties. ↑ 10% of the Mittelwerk rackets uised a guide beam for cutaff. ↑ "Lang-range" in the context o the time. See NASA history article. This page wis last eeditit on 4 Mey 2017, at 03:56.